Amazon launched its new product targeting tool in early November, making it even easier to tailor the way your ads appear on the site. These features are now available via Sponsored Product Ads, letting you align your product ad with similar categories, products or product specs so shoppers can more easily find your products. Though related to Product Display Ads, product targeting is a more flexible strategy that brings options to the table Amazon advertisers haven’t had in the past. Whereas Product Display Ads only allow one ASIN per ad campaign, product targeting can accommodate multiple ASINs and lets you target them by category, individual product or both, with the added benefit of negative targeting to further expand your strategic options. 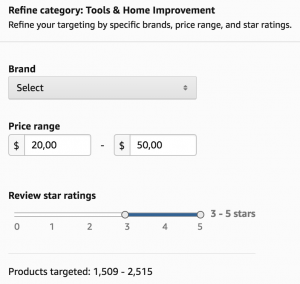 Targeting by category includes a refinement tool that helps you place your product in front of shoppers searching within star levels, price ranges or brand categories, which can boost performance pending testing results. Targeting individual ASINs is similar to traditional Product Display Ads, but it has some additional benefits. You can adjust the cost-per-click bid levels for each ASIN — a good strategy for cross-selling or protecting high-value individual products. With this wave of new features, it’s a good time for smart advertisers to start upgrading their product-targeting on Amazon.